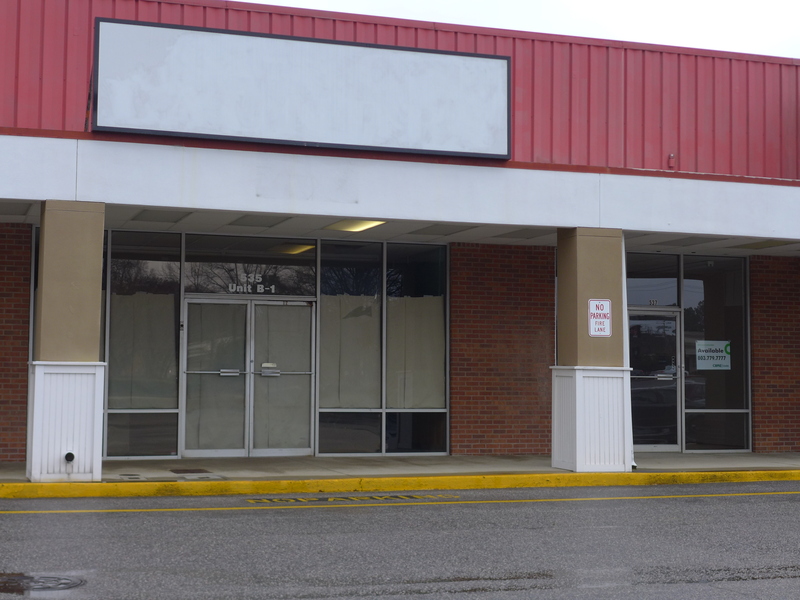 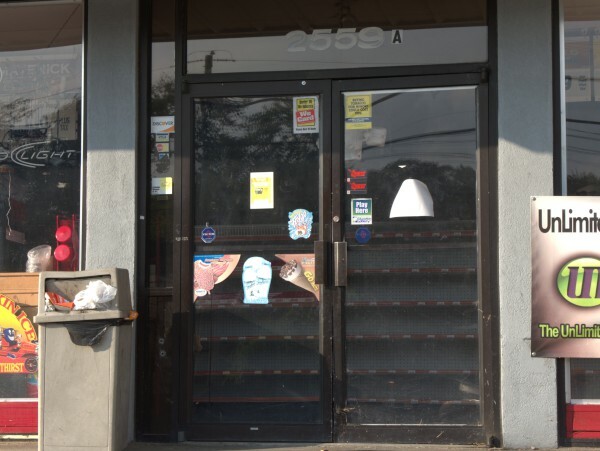 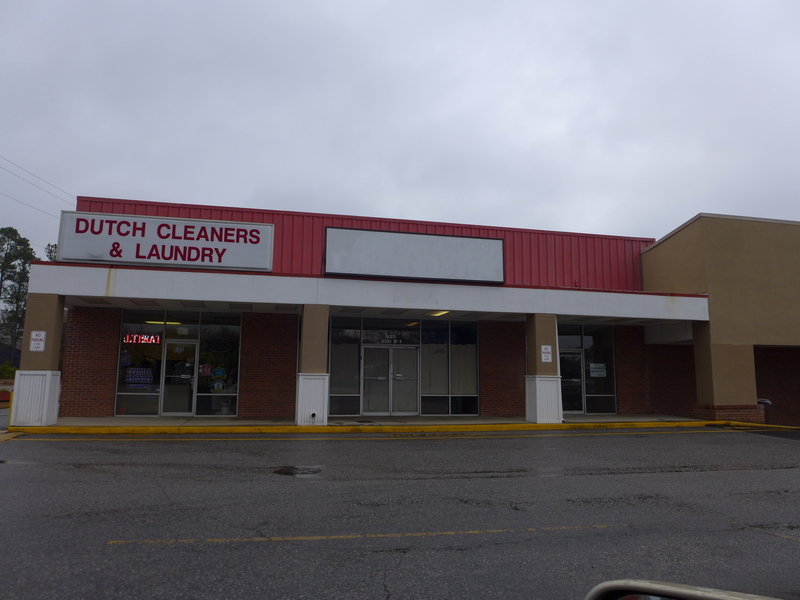 As commenter Andrew noted, Mrs. C's Laundry, next to Dutch Cleaners in the IGA plaza (which seems to have no name) has shut down. 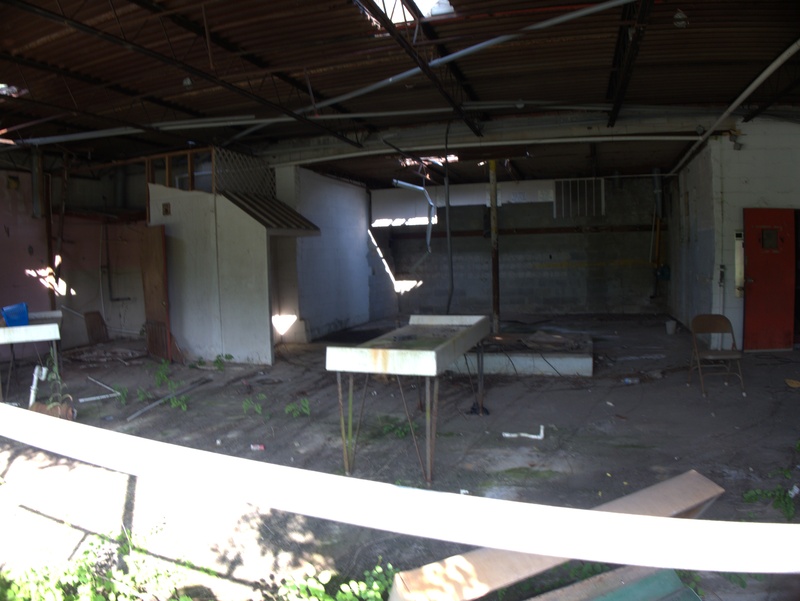 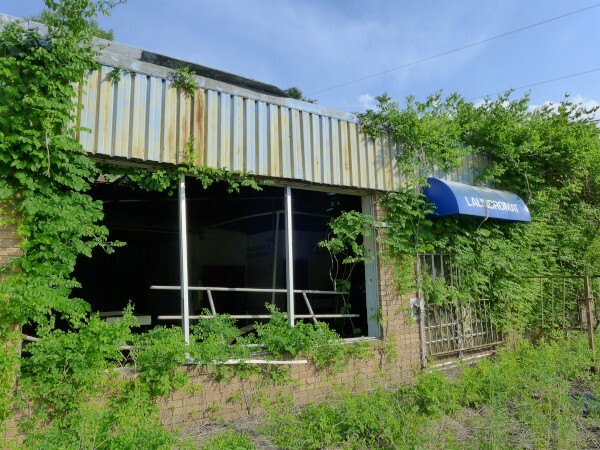 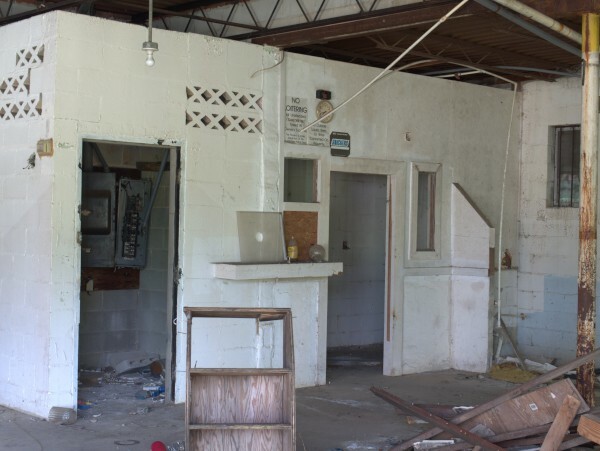 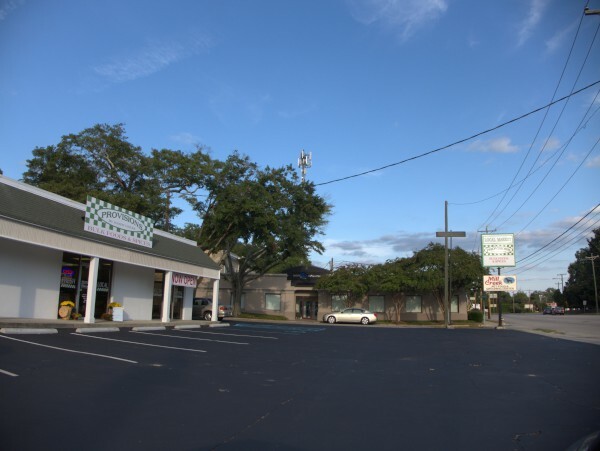 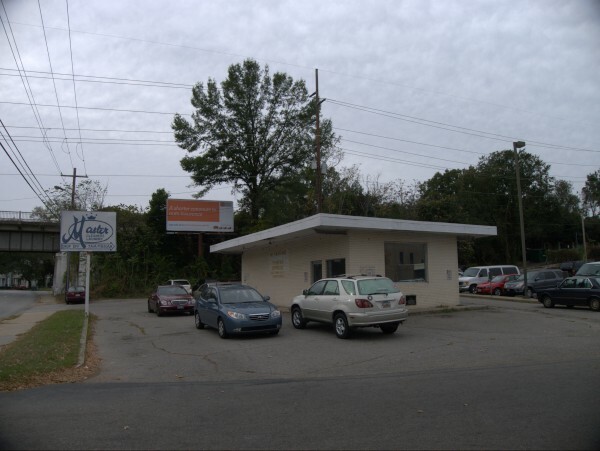 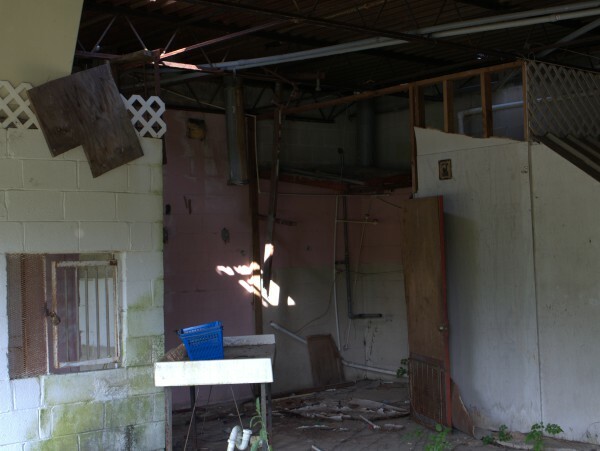 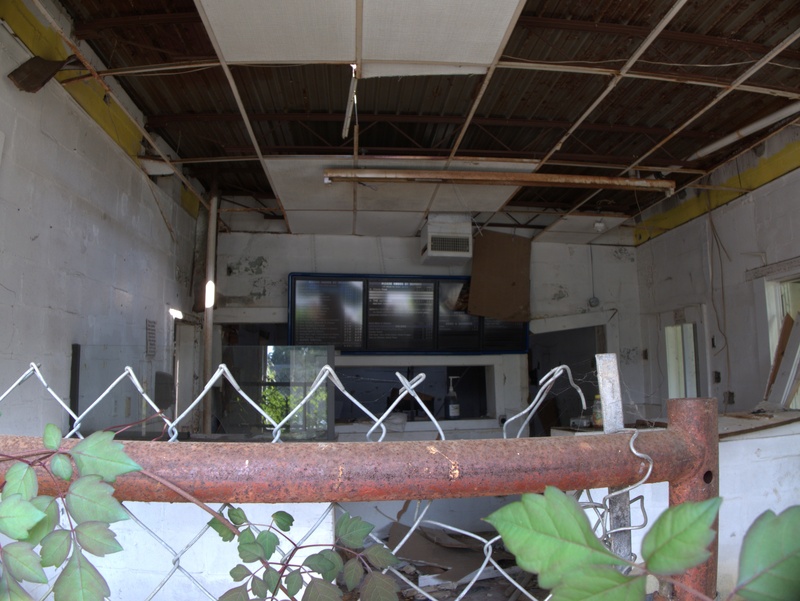 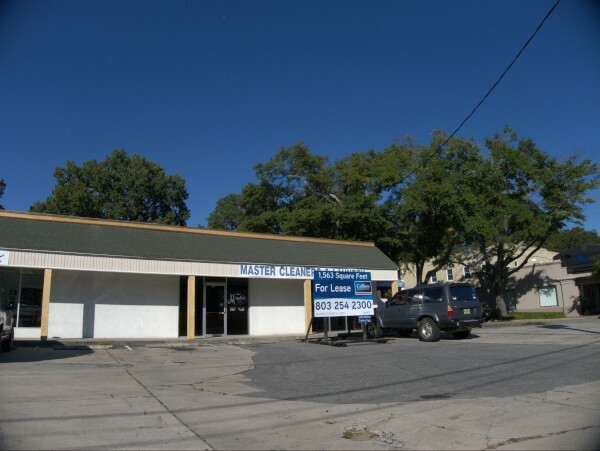 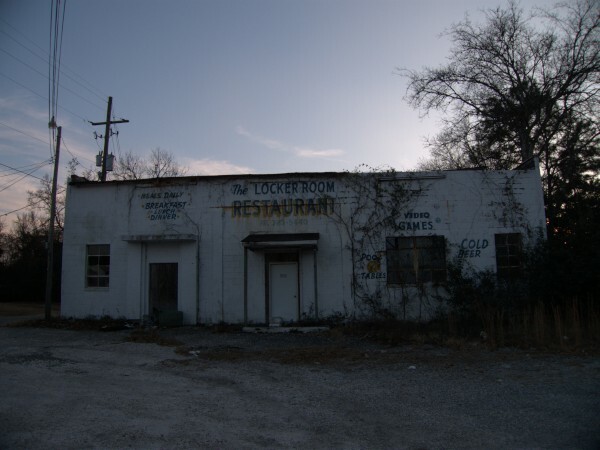 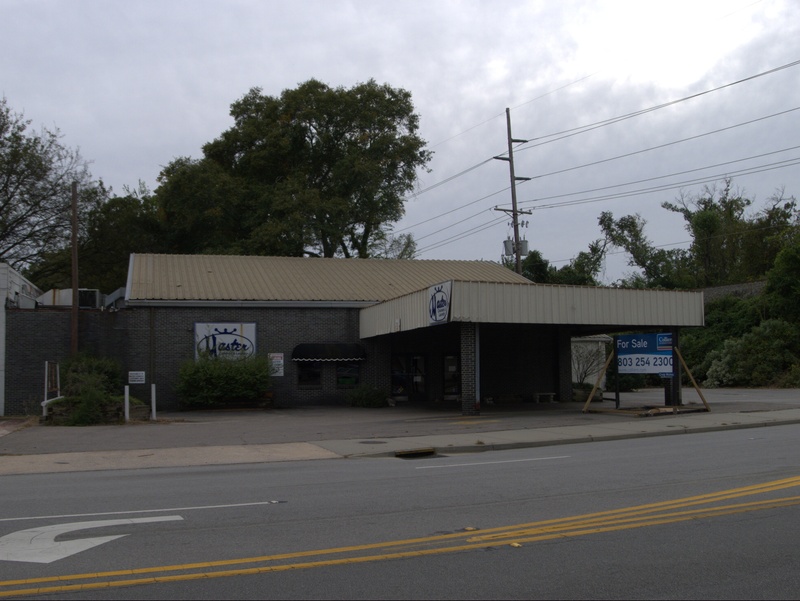 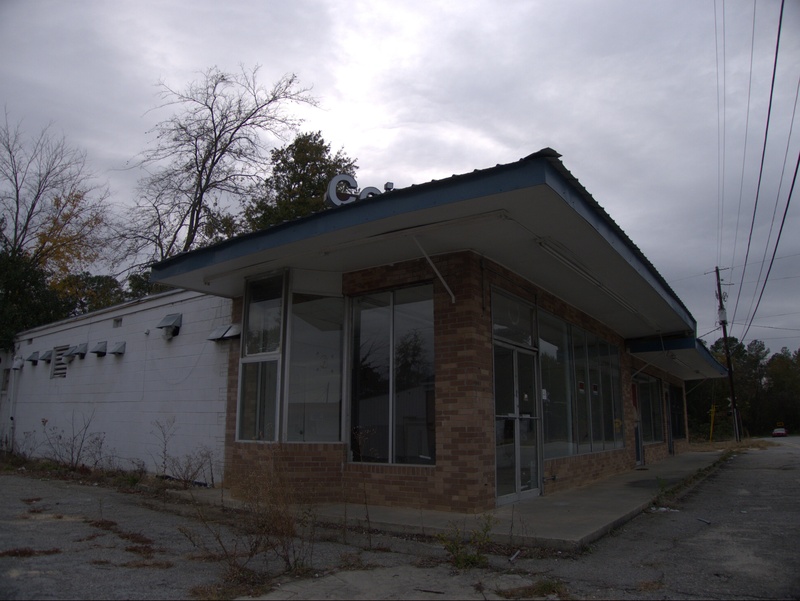 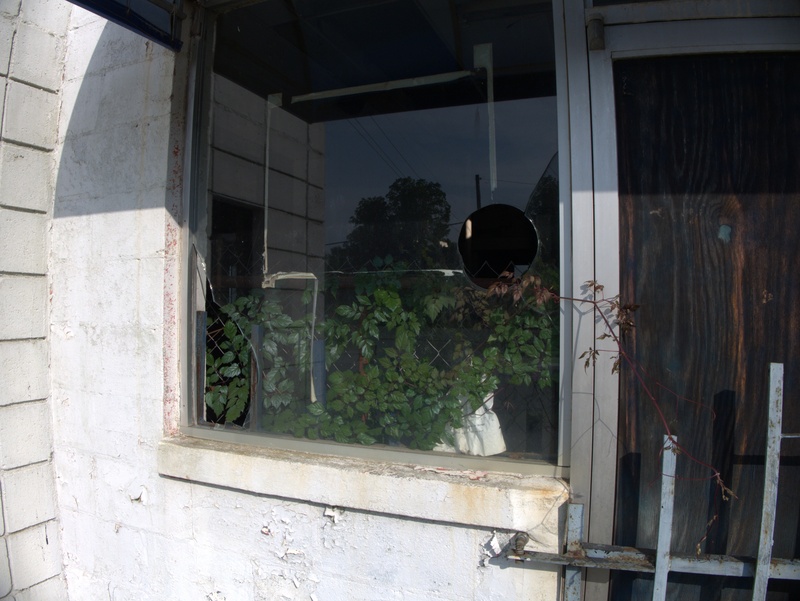 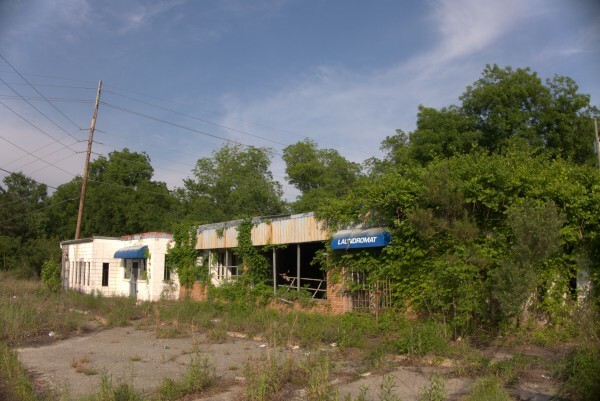 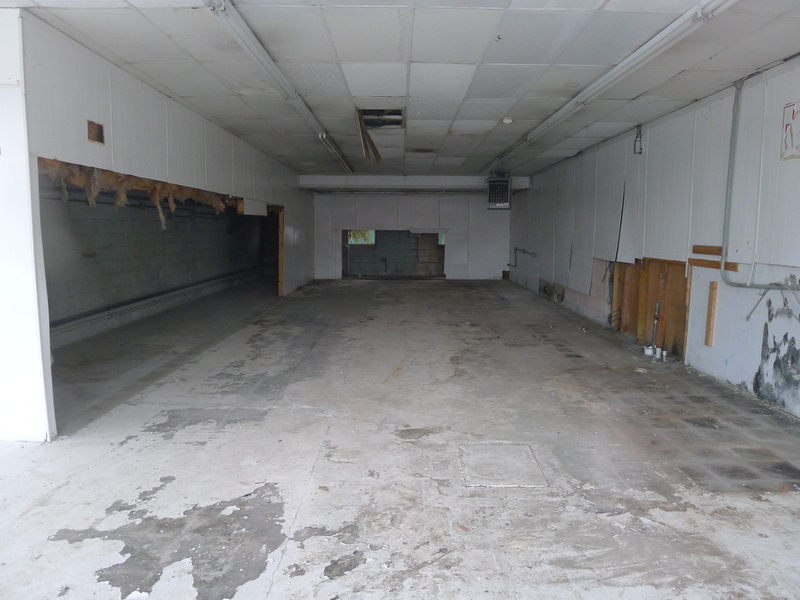 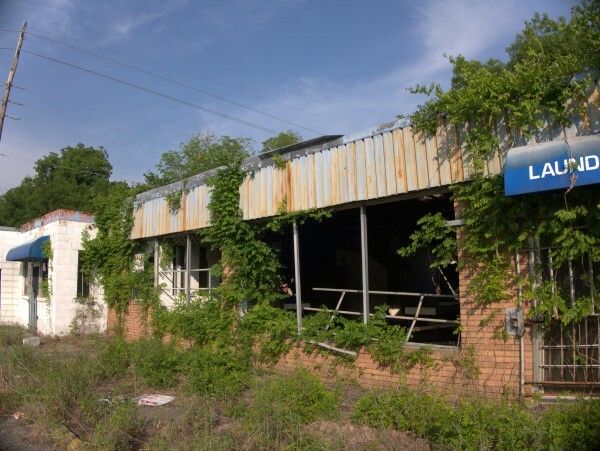 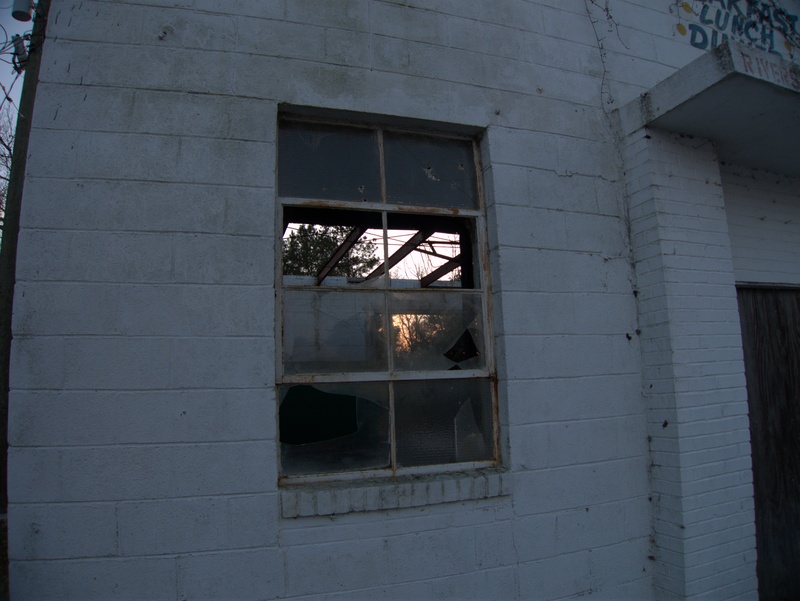 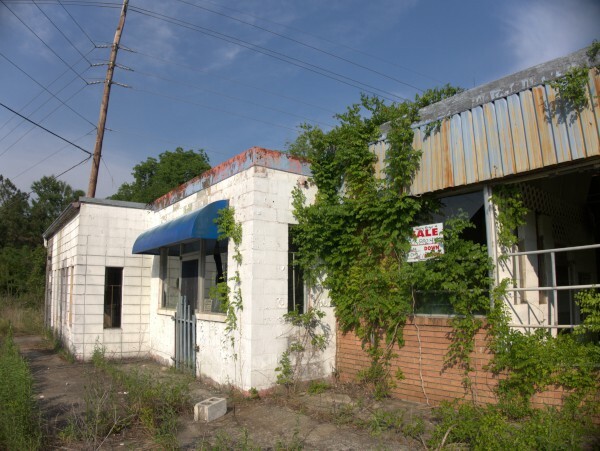 I noticed this pair of co-located derelict businesses driving US-601 through St. Matthews towards I-26 this Spring. 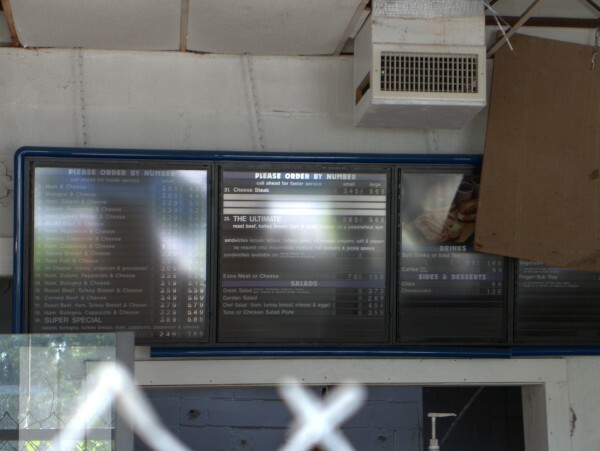 I wasn't sure at first what the restaurant was, but a close look at the menu board pretty well pins it down to a Sub Station II. I can't think of any obvious reason why both businesses in this building would have failed at what seems to be more or less the same time. 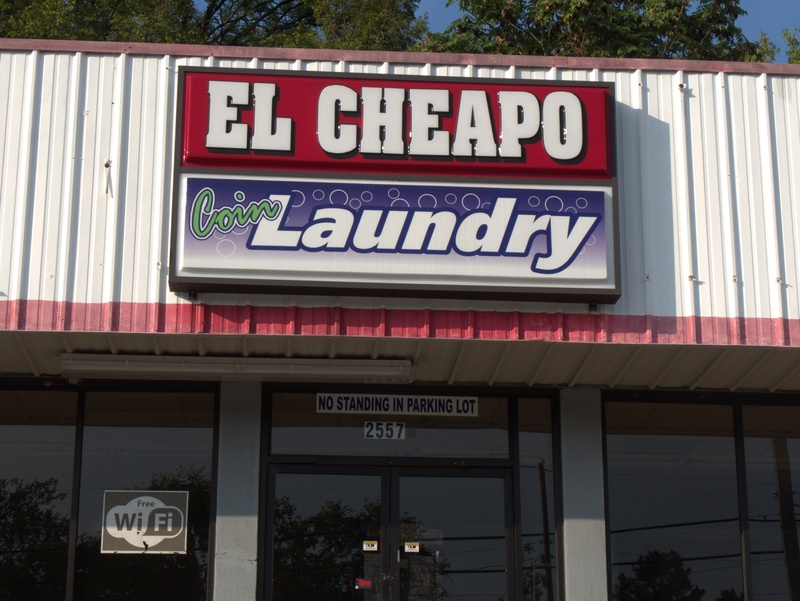 While the restaurant market is fickle, laundromats are places where you must go. 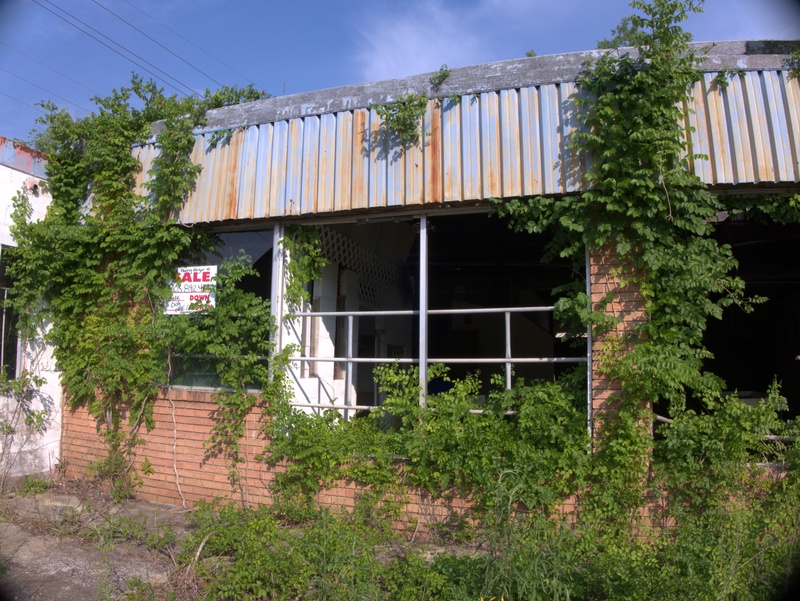 I'm guessing early 2000s for the timeframe here, but the building does seem rather enthusiastically vine encrusted, and if the realtor posting the sign does succeed in selling the place, I doubt there's much that can be done beyond knocking the place down and starting over. 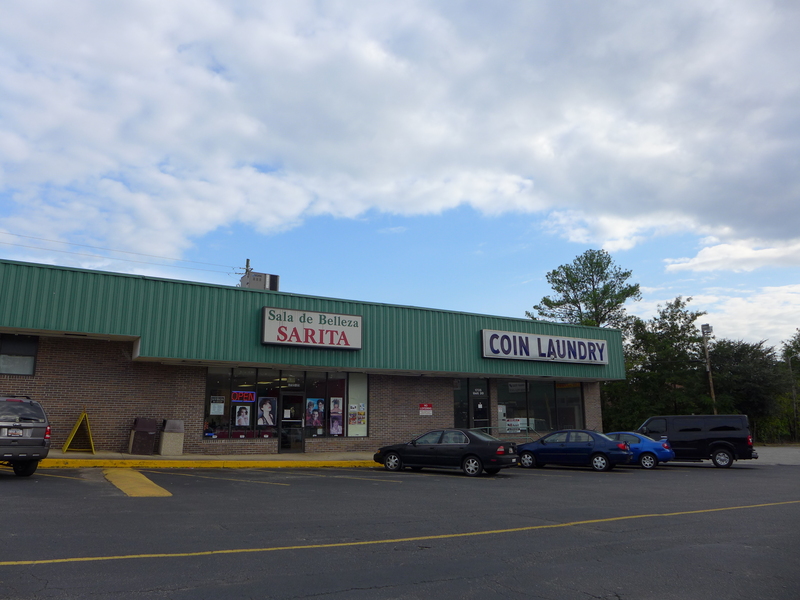 This laundromat was in the Family Dollar plaza on Decker. 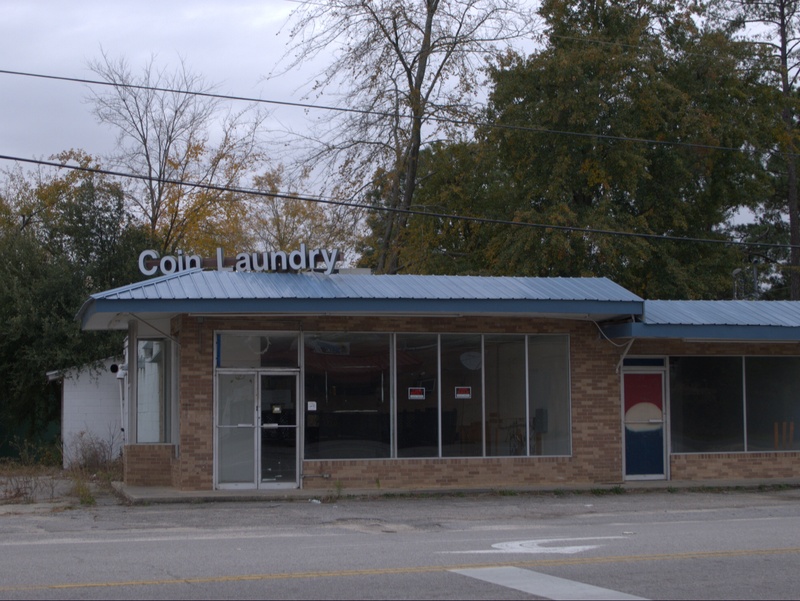 I've been to several of the coin laundries on Decker over the years when either the washer or dryer was on the blink. 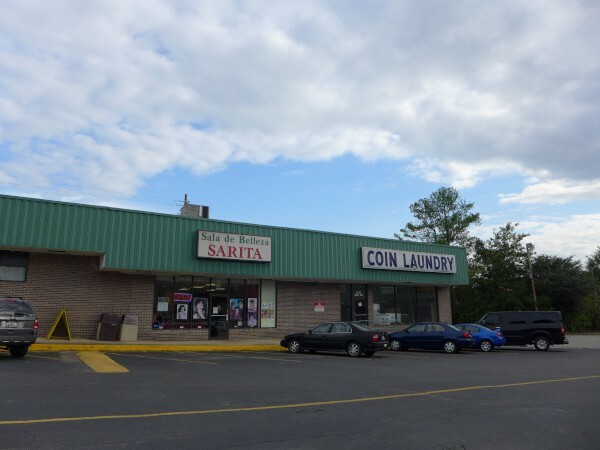 My favorite is the one in front of the old Target which has very active family management -- there was always someone sweeping, mopping or otherwise keeping the place tidy, and once the woman in charge was taken aback by my incompetence at shirt folding and showed me how to do it right (it didn't take, I'm afraid). 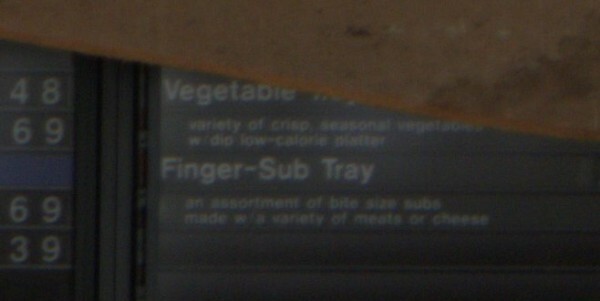 This one I never made it to. The marquee name of Coin Laundry seems to be more a description than an official name, so I'm not exactly sure when it closed, but I'm guessing within the last few years. 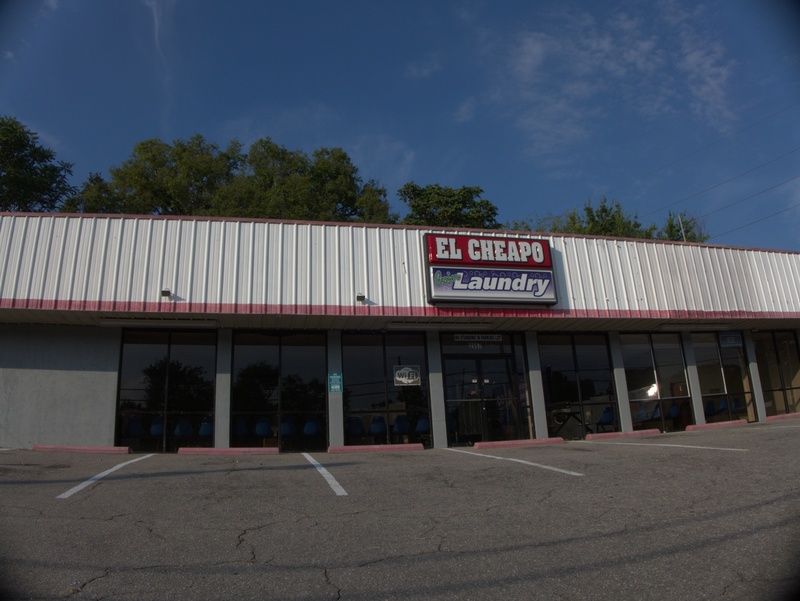 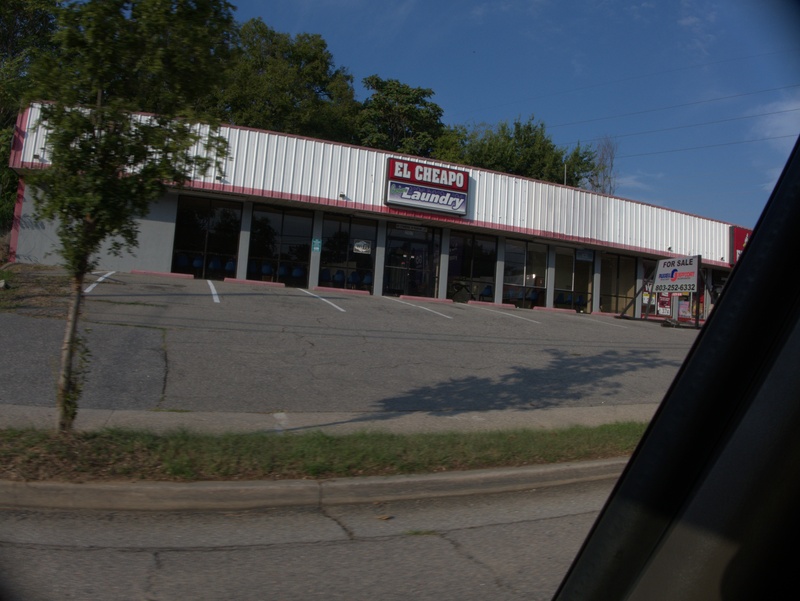 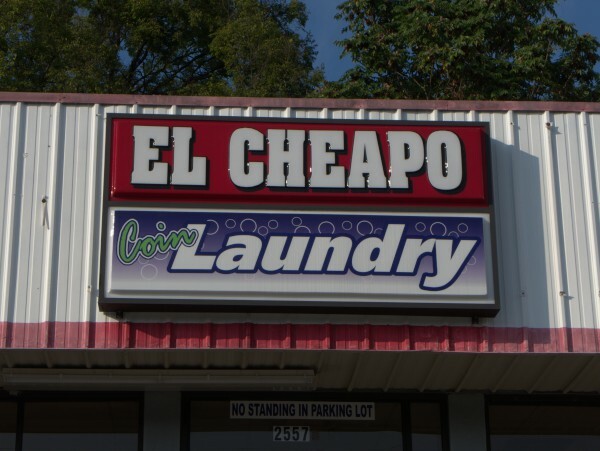 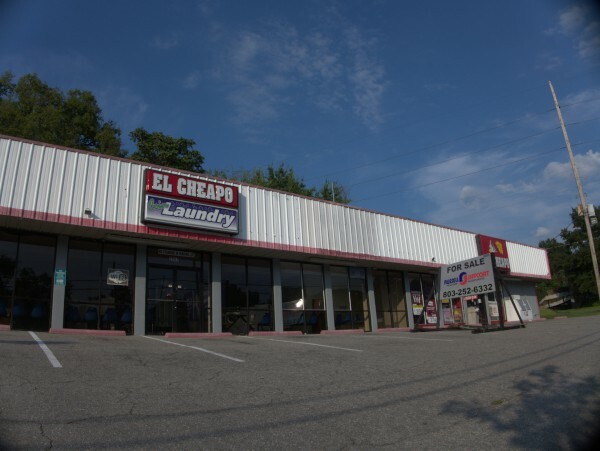 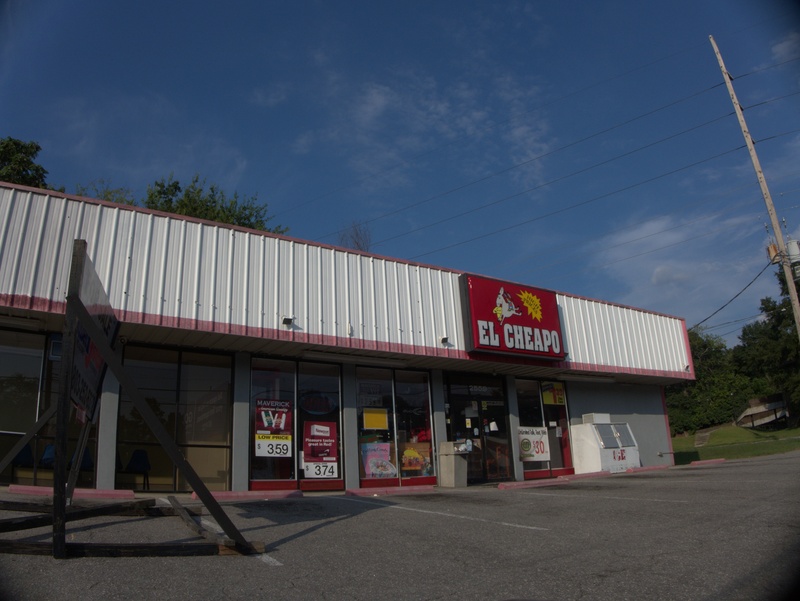 I believe the El Cheapo branding for this Millwood laundromat is fairly recent. 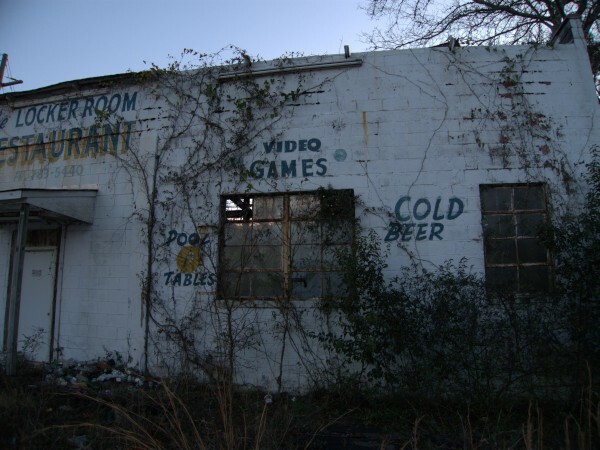 Before that, it was Suds or something like that. 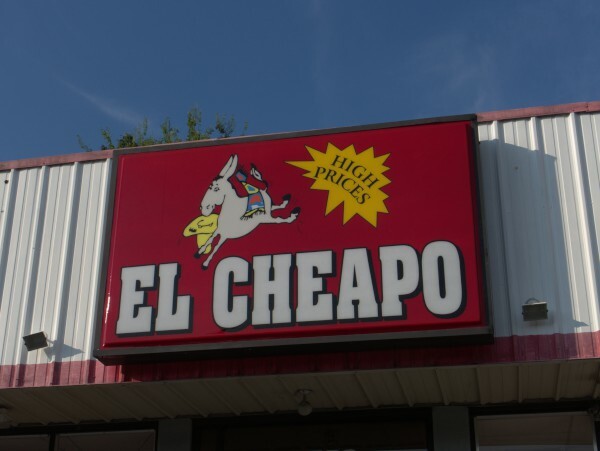 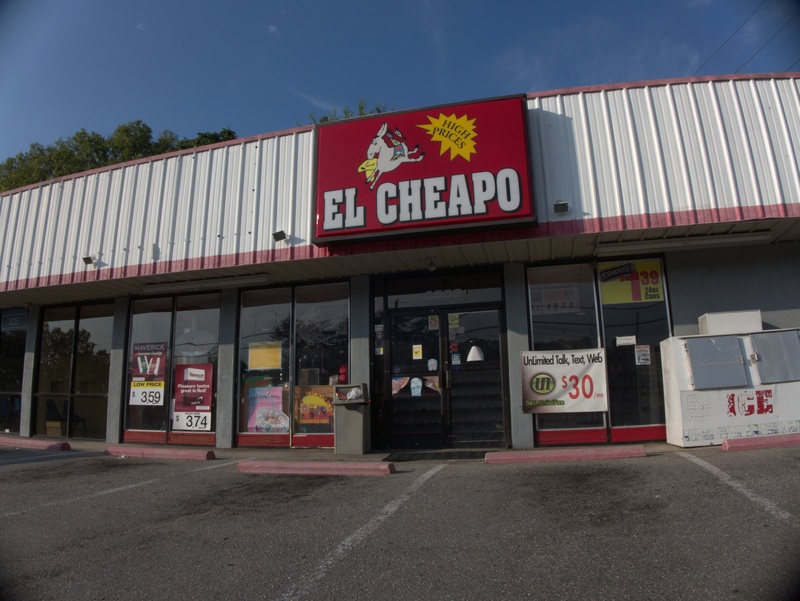 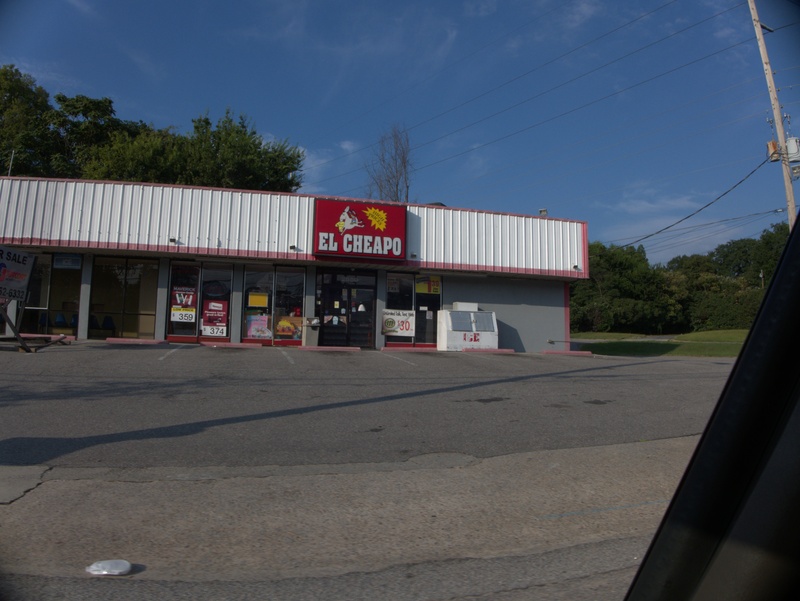 I don't think the convenience store was an El Cheapo until recently either. 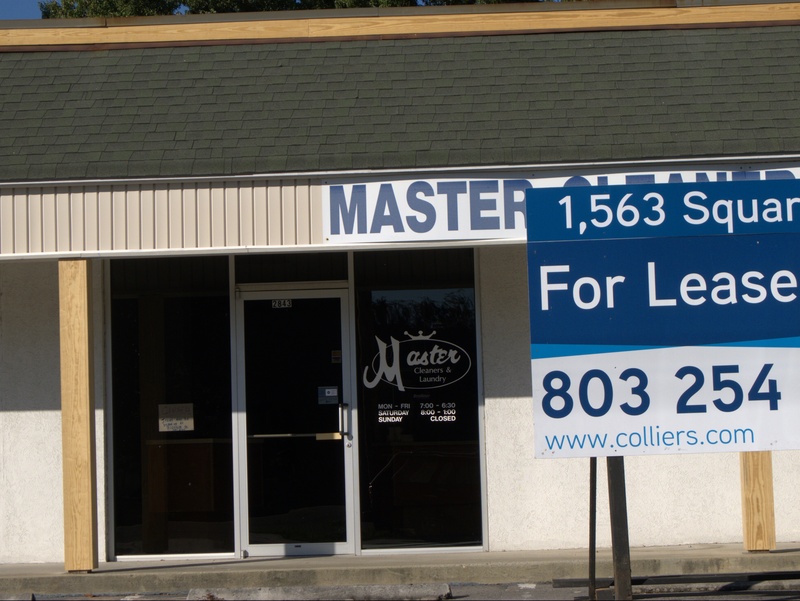 At any rate, apparently both were now under the same ownership and failed together early this month. 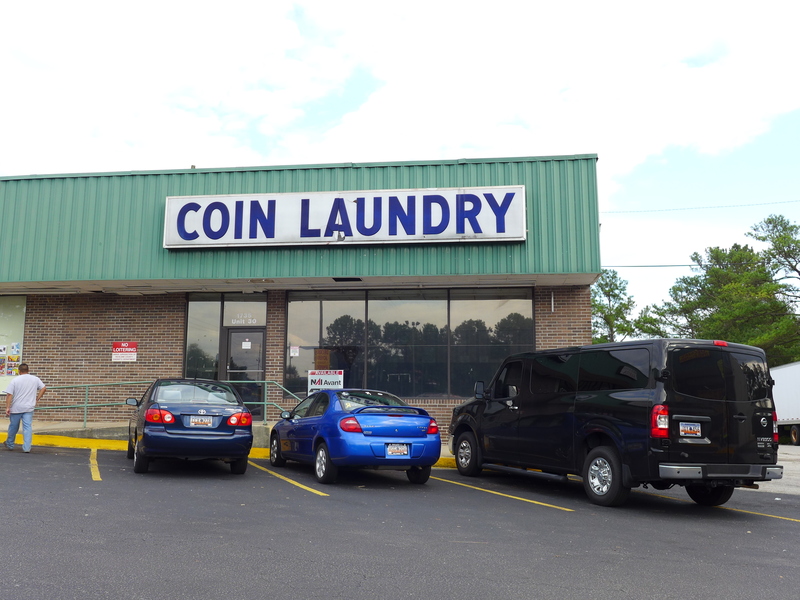 I wonder if they will sell off the commercial washers -- those can be quite hardy units. 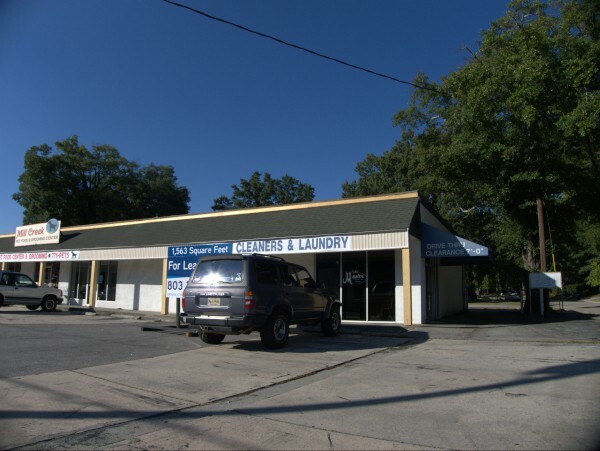 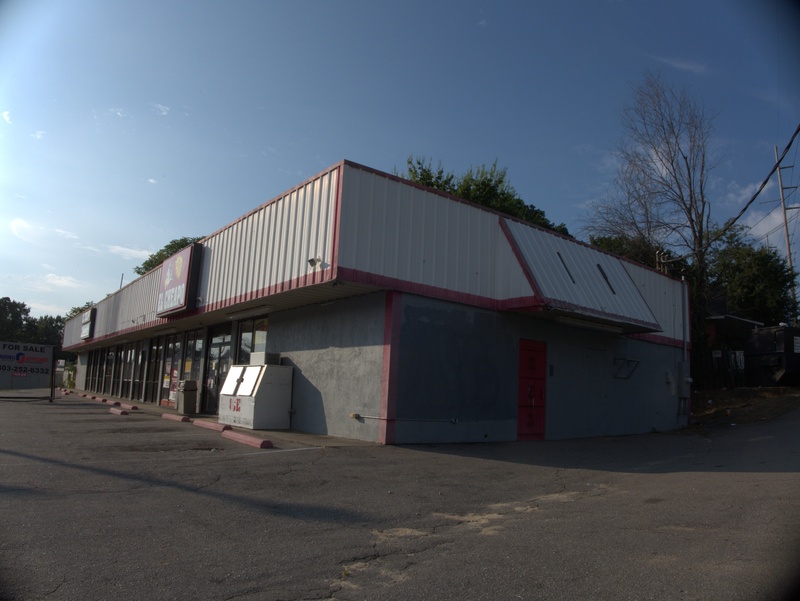 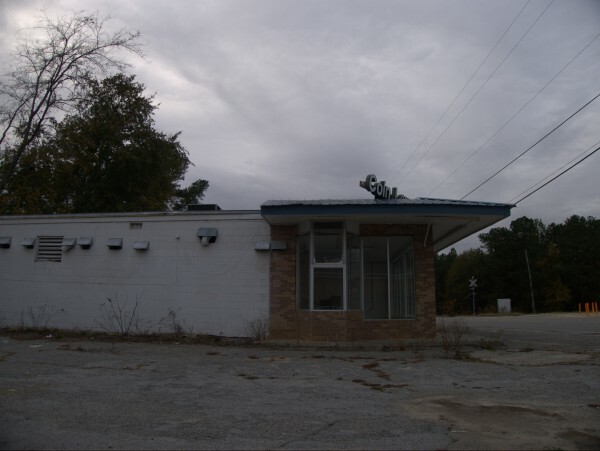 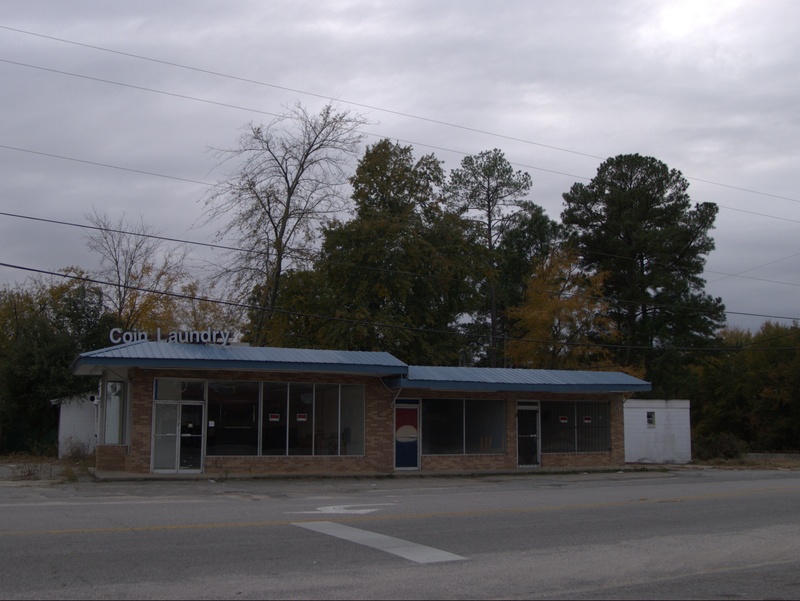 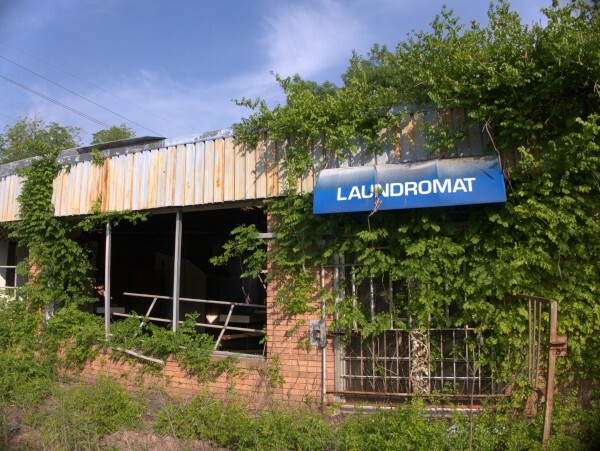 This old laundromat is across the street (Dunbar Road) from Frink Street's Town & Country plaza, and looks to have been vacant for a good while. 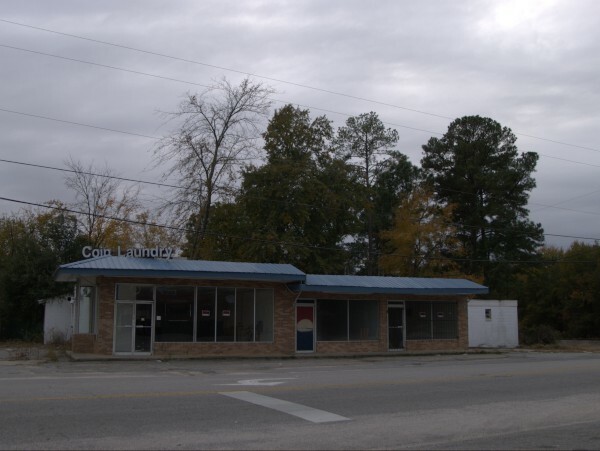 City Feet says it was built in 1970. 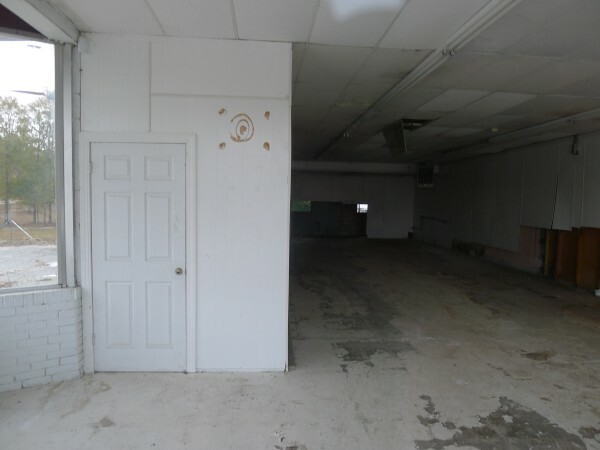 To me it looks a little earlier. 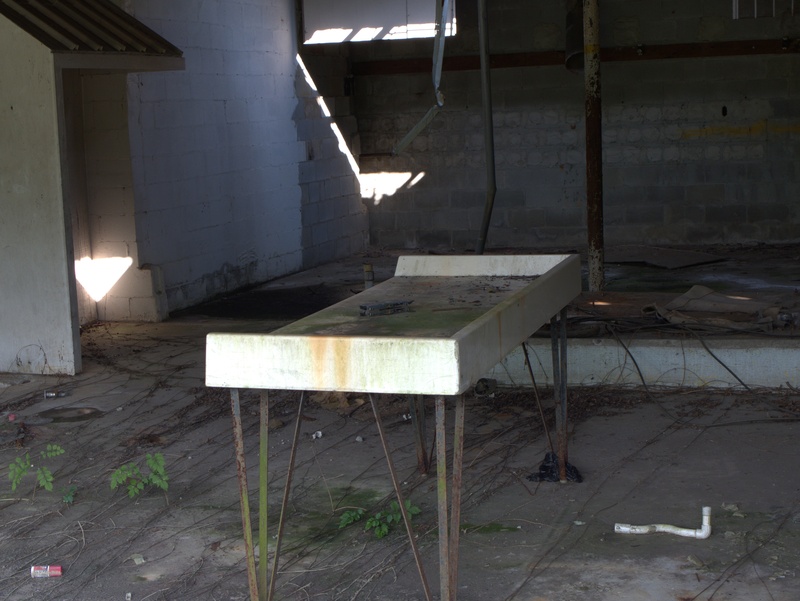 These places always had a certain smell, and a certain look, with the soap dispenser machine with its metal levers and slots, the hard plastic bucket chairs welded to a rail, and the plastic high folding tables. 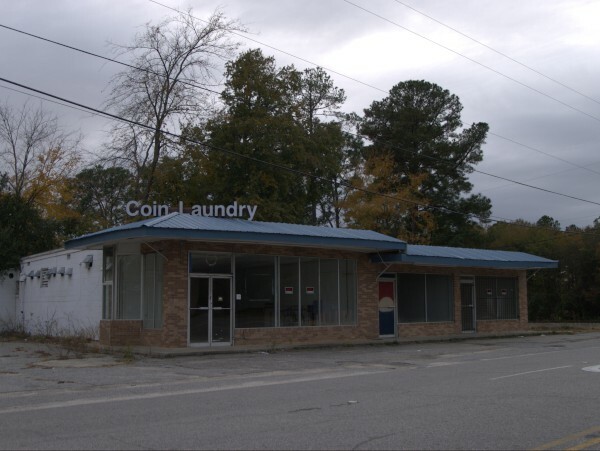 And of course, the whish-whish sounds of the washing machine agitators and the clinks of metal buttons each time the jeans got to the top of the dryer drum and fell down again..
UPDATE 14 December 2012: Updated the closing date from "1980s" to "mid-2000s" based on the comments. 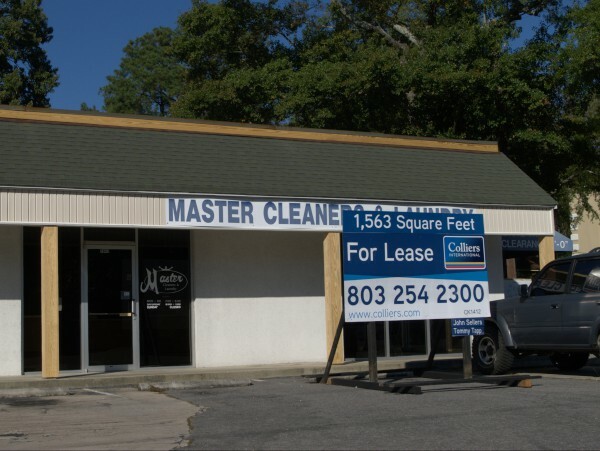 Commenter Mayr Douglass mentions that many (or all) Master Cleaners in Columbia have closed recently. 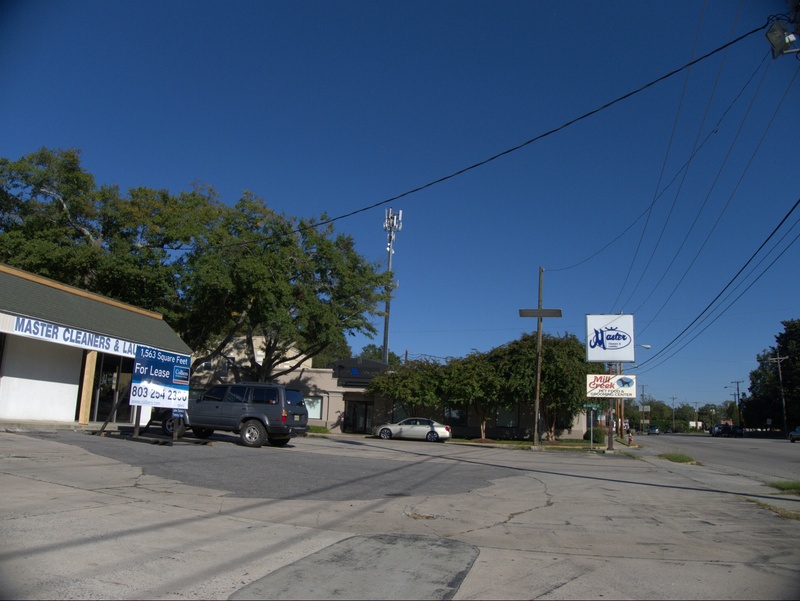 So far, I've only checked out this one, on the corner of Millwood & Hagood Avenues. 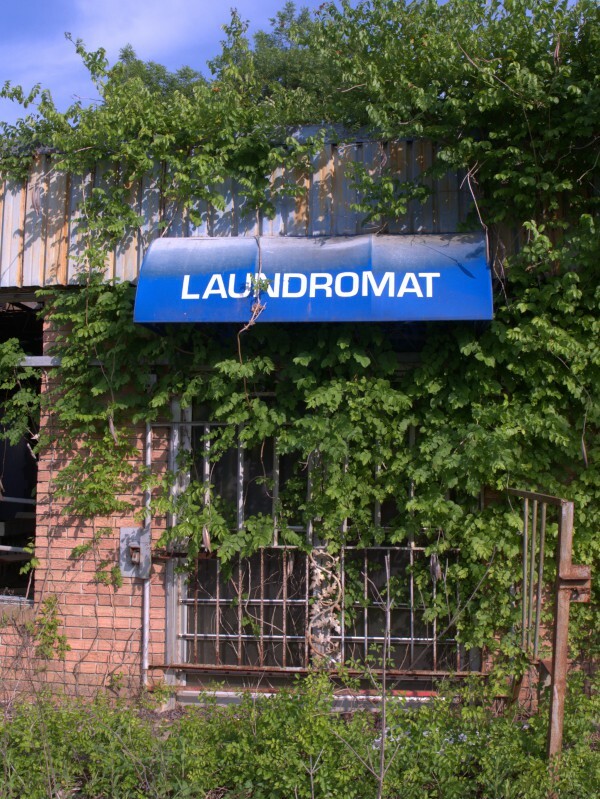 In Clothes Cleaned the Mas-ter-ful Way. 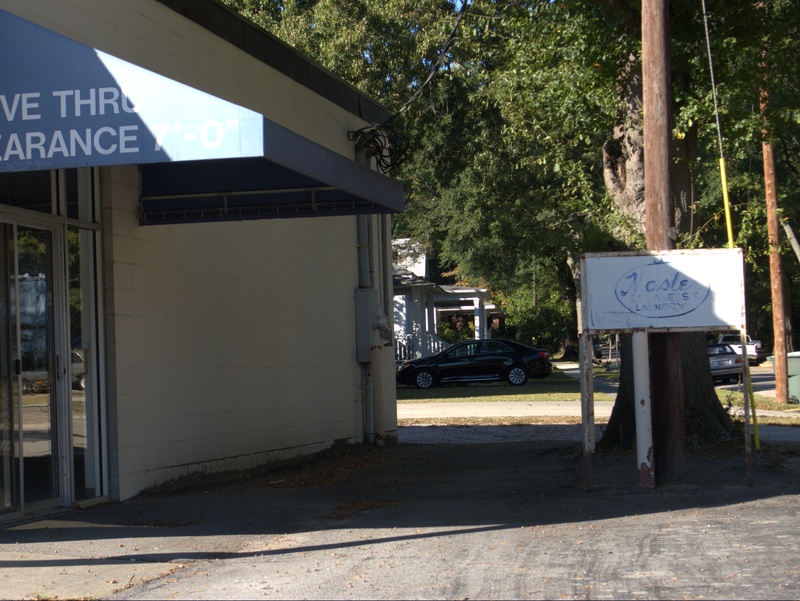 This story from The State talks about the new operation. 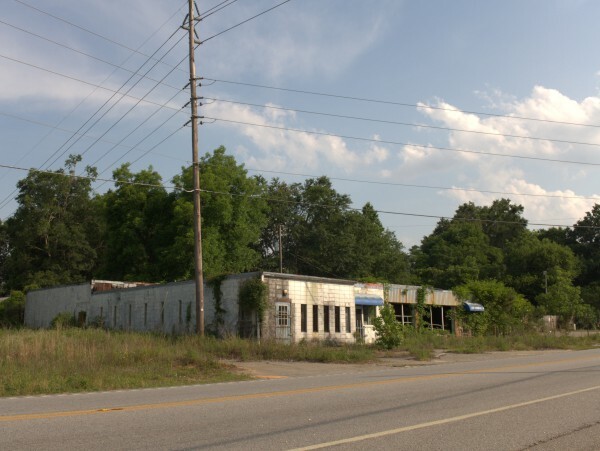 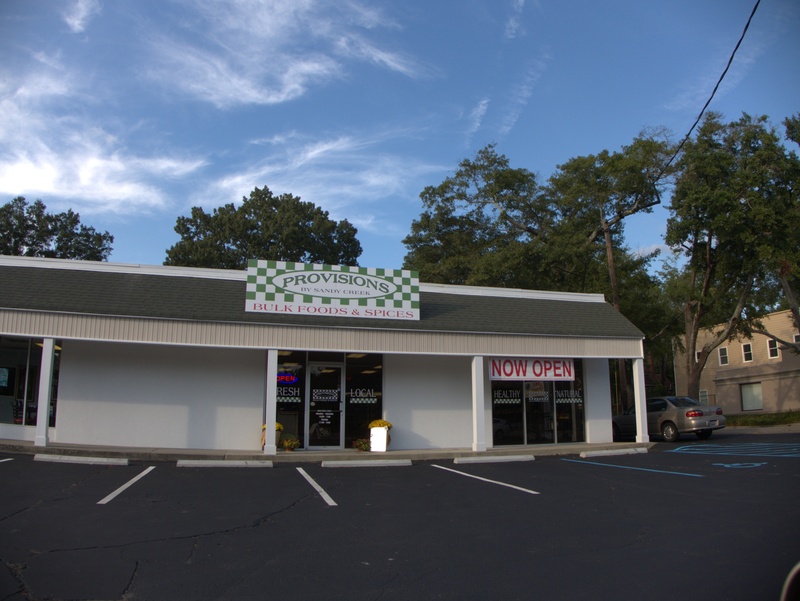 I noticed this place in Eastover on the west side of The Sumter Highway just past Horrell Hill last week. 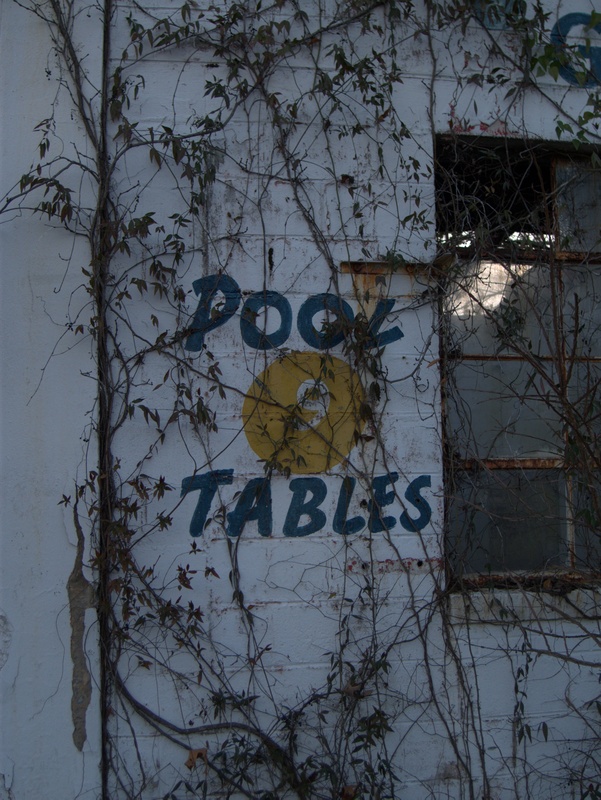 This former restaurant and pool hall has obviously been there quite a while, and has just as obvioiusly been out of business for many years too. 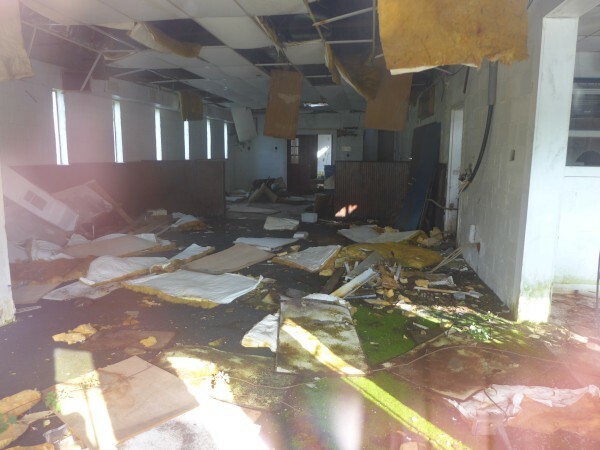 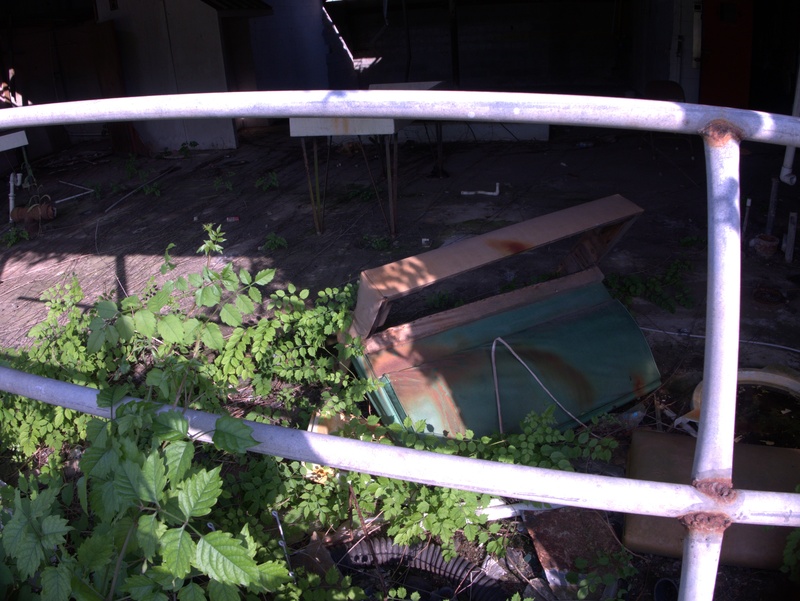 (In addition to the clinging vines, most of the roof seems to be gone as you can tell in some of these shots). 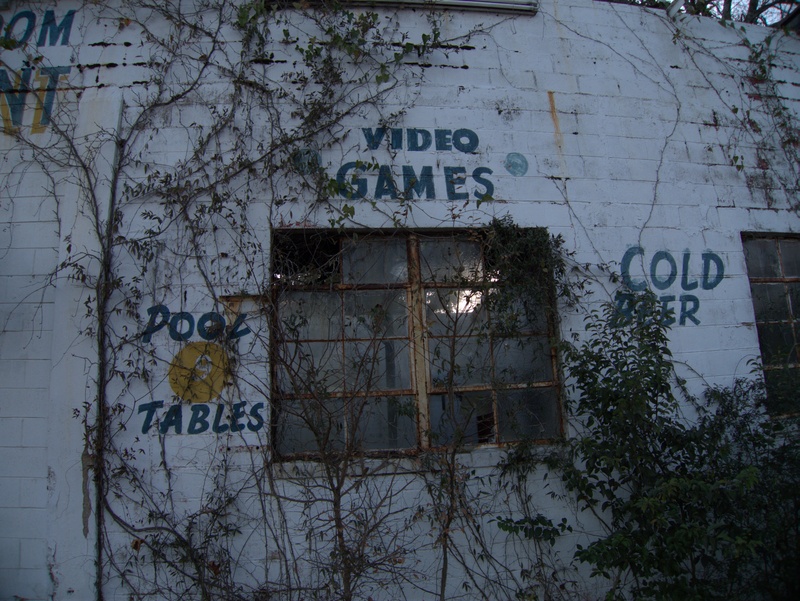 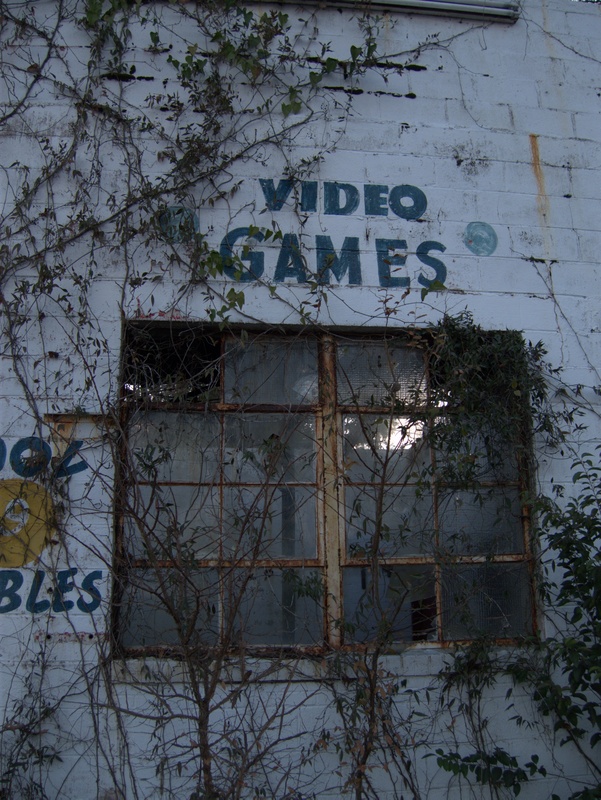 I suspect from the "Video Games" signage that it was last open during the video poker era, but not until the actual end of that era as it does not seem to be listed in the 1998 phonebook. 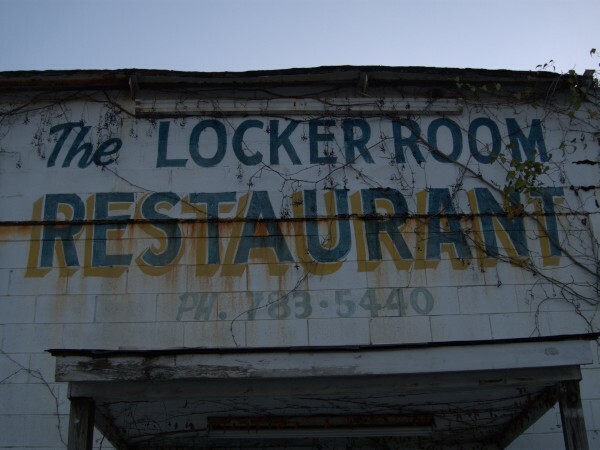 I got Rivers Variety Store and The Locker Room from the signs. 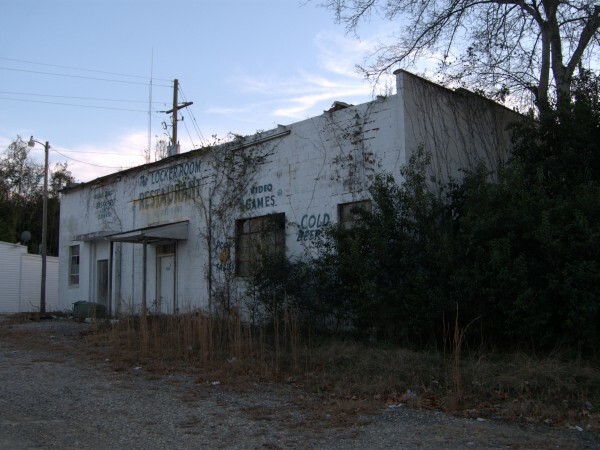 Googling the phone number, (803) 783-5440 brought up the Jerry Thompson name. UPDATE 21 Dec 2010: Added Laundry to post title based on the comments. 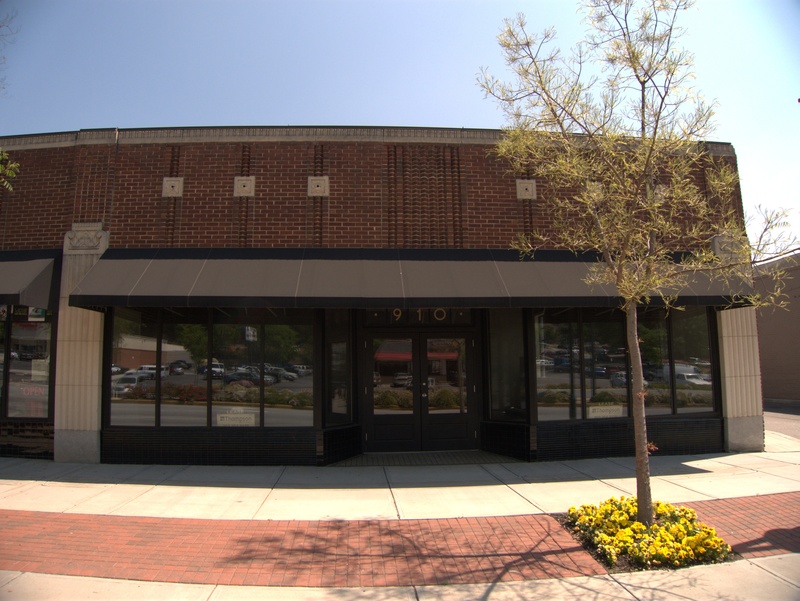 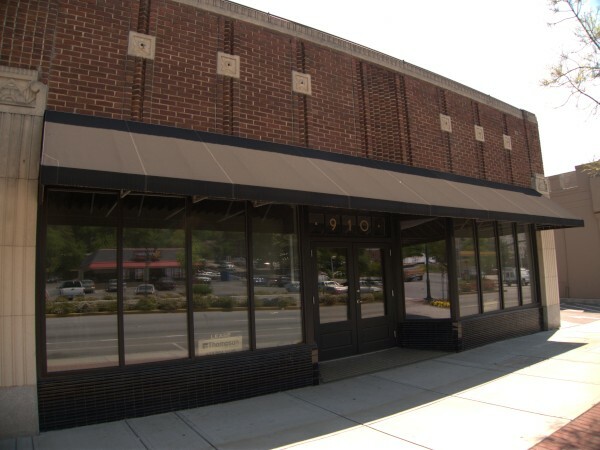 This rather handsome brick building on Harden Street in Five Points was, according to the Historic Columbia Foundation, built as a laundry in the 1930s (this city property valuation report claims it was actually built in 1930). I'm sure it has been many things over the years, but most recently, it seems to have been a used furniture store called Habitat Store which was associated with The Habitat For Humanity charity. 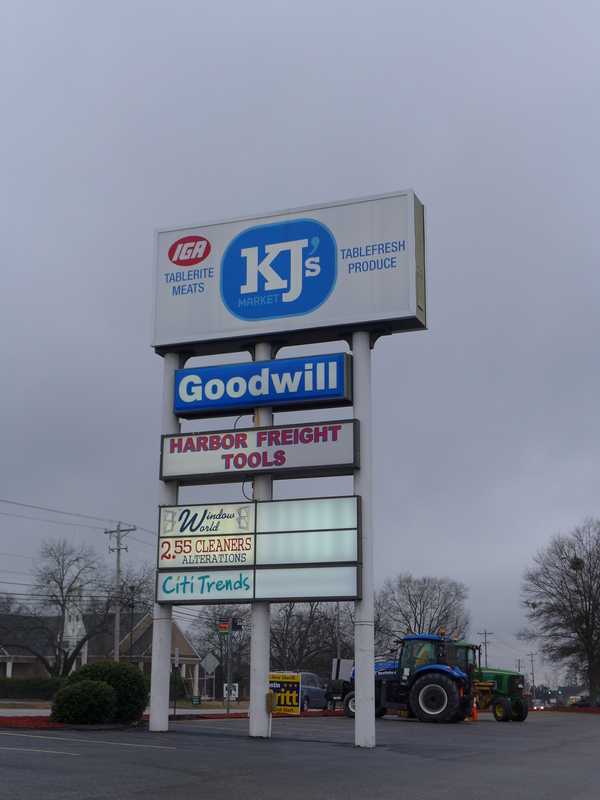 I used to love going to used furniture stores, back when they were "junk stores" rather than "antique stores", but I can't ever recall this one, so I'm guessing it probably started after I left town in the mid 80s.